On 13 February 2008, then Prime Minister Kevin Rudd made a formal apology on behalf of the Australian Parliament to Australian Aboriginal and Torres Strait Islander peoples, and in particular to the Stolen Generations. 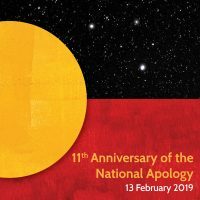 February 13, 2019 marks the 11th Anniversary of the Apology, acknowledging those who suffered because of past government policies of forced child removal and assimilation. 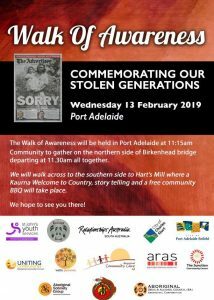 There are events held in and around Adelaide to honour the Stolen Generation Survivors, and to inform non-Aboriginal community about their ongoing needs. These events also feature cultural activities, symbolic walks, storytelling, speakers, food and entertainment. 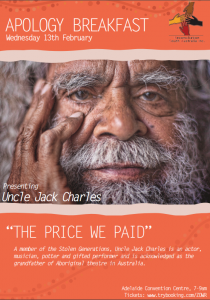 Uncle Jack Charles, legendary actor and member of the Stolen Generations, will present at the breakfast. Uncle Jack is an actor, musician, potter and gifted performer. Who, in his 75 years he has also been homeless, a heroin addict, a thief and a regular in Victoria’s prisons. Acknowledged as the grandfather of Aboriginal theatre in Australia, Uncle Jack co-founded the first Aboriginal theatre company, Nindethana, in 1972. His acting career spans over six decades. This year’s breakfast will be held at The Convention Centre from 7-9am. Bookings are required. Stolen Generation Sponsored Seats may be available to members of the Stolen Generations at no cost to them. This event is unfortunately sold out. The Walk of Awareness will be held in Port Adelaide 11.30am – 2pm. Meeting at 11:15am on the northern side of Birkenhead Bridge, departing at 11:30am as a group. Walking together back over the bridge and ending at the BBQ’s at Harts Mill. 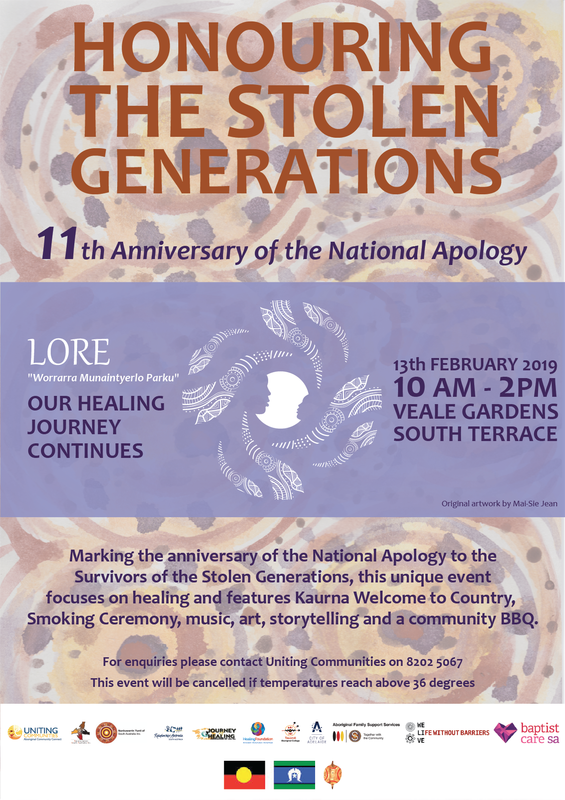 The event will include a Smoking Ceremony, Kaurna Welcome to Country, nominated speakers who will talk to the awareness of the Stolen Generation and story tellers who have a story associated to their journey within the stolen generation, and a band for light entertainment. 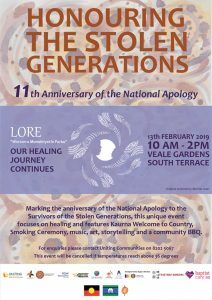 An event commemorating the 11th Anniversary of the National Apology to the Survivors of the Stolen Generations will take place at Veale Gardens from 10 am – 2 pm. The event focuses on healing and will feature a Kaurna Welcome to Country, Smoking Ceremony, music, art, Ngangkari traditional healers and a free community BBQ.